There are a few books out there that every Christian family needs to keep in their home library. A few of mine would be "The Five Love Languages", "The Total Money Makeover", "The Case for Christ" and a handful of others come to mind. Every once in a while a book comes around and fills a new spot on this shelf. 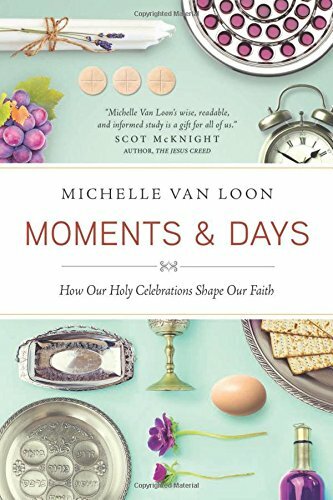 This new addition is "Moments and Days" by Michelle Van Loon and it is a beautiful journey through the history and celebration of holidays and holy days. As a Messianic believer in Christ, Michelle takes us through the Jewish observations of the Old Testament and how we can incorporate a celebration of God's goodness and faithfulness into our yearly calendar. She also goes through the importance of each holiday in the Christian faith and how those can have a deeper meaning. I found her description of how Jewish people have in history and currently honor the Sabbath to be so incredibly convicting and challenging. This book is full of scripture and you can tell Michelle did a great amount of research. This would also be a great reference for homeschooling families to use before each Jewish or Christian holiday. This book made me want each holiday to have a deeper meaning in our home and I will be sharing it with my husband and kids so that we remember God's unfolding story throughout history.